Like most International Hot Rod Association (IHRA) Sportsman racers, Corey Manuel has a job in the real world, and drag racing is his hobby. Doing double duty is common. Driving duel event entries in the same race is also normal, but winning both of them in the same event weekend is a bit uncommon. But that’s exactly what Manuel did – he races both Super Rod and Quick Rod in the inaugural IHRA Summit Sportsman National Championship. Earlier this season, Manual did the double dip winning the Super Rod Ironman Trophy in the first event of the Palm Beach International Raceway Summit Sportsman National Championship event and the Quick Rod title in event two. Now with only one race weekend remaining in the Summit Sportsman National Championship schedule, Manuel hasn’t visited the winner’s circle since his Palm Beach triumphs, but he’s third in the Quick Rod point standings just 13 points out of second place. 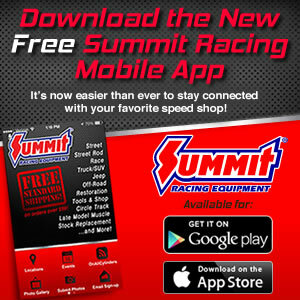 He definitely appreciates the opportunity Summit Racing Equipment has provided in backing this new national competition. “I do like the new format,” Manual said. “I’ve always wanted to chase national points on the IHRA side throughout the whole year. I’m happy where I am; of course I wish I could do a little better, but as long as I can finish in about the top five, I’d be really blessed and fortunate to do that. Manuel lives in Winston-Salem, N.C., and graduated from North Davidson High School just south of town in 2015. He earned his certificate in heating, ventilation and air conditioning (HVAC) technology and works at his father’s Winston-Salem HVAC company, Custom Systems, Inc. His father gave him his start in the HVAC business just as he did in racing.